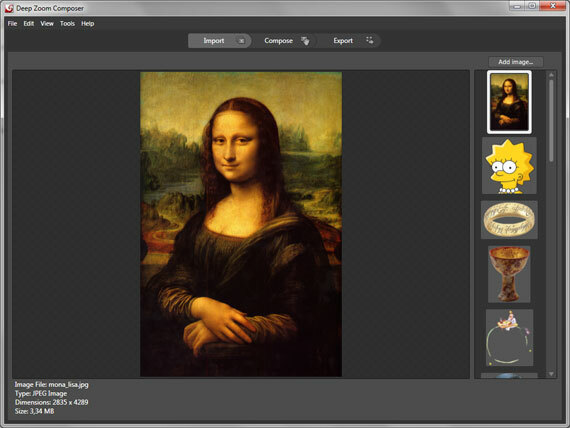 Deep Zoom Composer is a tool that allows you to prepare images for use with the Deep Zoom technology. You can download Deep Zoom Composer here. For the Mona Lisa Deep Zoom Composition I used a high resolution version of the famous painting as the background and many other images to hide as Easter Eggs. If you like to convert a high resolution image (e.g. panoramic photo, large map etc.) to the deep zoom format all you have to do is click on compose and drag the image from the list of available images to the design surface. To include multiple images into one composition just zoom into the areas where you like to place the image and drag you images to the design surface. 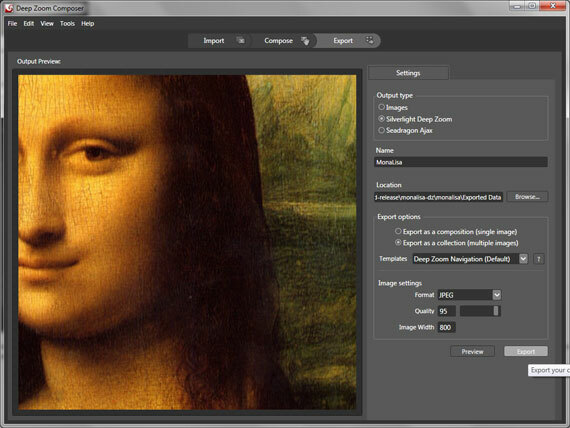 For the Mona Lisa Deep Zoom Composition I also specified menu items. To add a menu item click on menu and drag images from layers to the menu. 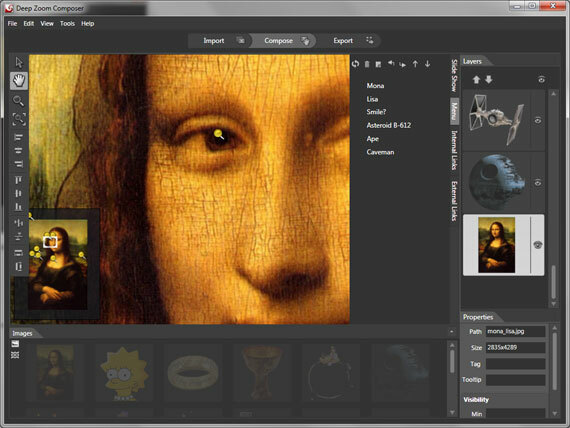 The Deep Zoom Viewer will display those menu items and automatically zoom to the area where the image is located. For this example I used the default settings. By default the output type is Silverlight Deep Zoom. In this case to view the composition Silverlight is required. If you choose Seadragon Ajax as the output type a Ajax based viewer will be generated that can be viewed even without the Silverlight plugin installed. To get the public link right click the main html file generated by Deep Zoom Composer and choose copy public link. Your Deep Zoom Composition is now online and can be shared with others. By now you have a good understanding and many ideas how to use Deep Zoom Composer. Give it a go and share you links in the comments below. Have Fun! is it possible to compose a deep zoom image dynamically? we are trying to find a way to compose all images of social media users that signs in into a website into one big image. the problem we have is how to recompose the big image automatically everytime a user registers into our website. I exported as a collection using the template – Deep Zoom Navigation (Default). Hi David, once you click on the embedded deep zoom image you can use your mouse wheel to zoom in and zoom out. I tried it with your deep zoom image and it just works fine. If you like to link to certain areas in your image you can do this as well. You can even add clickable hotspots to your image. Just look at the Mona Lisa sample to see how this is done. @Sivakumar: Live Labs Pivot & the Silverlight Pivot Viewer are very cool. I am working on a Pivot collection for this blog. The first version is now up and running. Just click on the Explore tab in the top menu. I will post about this soon. Silverlight Pivot Viewer from Djonatas Tenfen on Vimeo.